Pare Corporation has been a trusted engineering partner to municipal and state governments, owner/developer teams, architects, and other design firms for over 47 years. Pare currently employs 90+ technical and support personnel, including 41 Professional Engineers registered in more than 15 states. 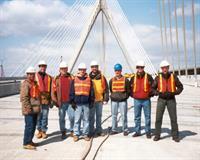 Our engineers, planners and scientists specialize in the areas of civil, structural, geotechnical, environmental, wetlands, environmental permitting, water/wastewater, solid waste, transportation planning/traffic, bridge and highway design, site design, waterfront/marine, dams, land development, and facilities maintenance. Pare’s services range from environmental and condition assessments, feasibility studies, and master planning to complete sustainable design services, LEED documentation, project permitting, and construction administration. The firm serves all of the Eastern United States from offices in Lincoln, RI and Foxboro, MA.